It’s not the best luxury car on the market, but the Genesis G80 might just be the best value luxury car you can buy right now. Every single person we stopped to look at our disguised G80 was impressed by its exterior aesthetics and beautifully appointed interior. They just couldn’t tell what car it was. 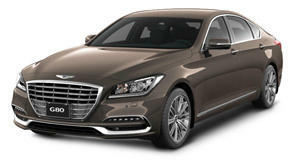 Hyundai’s luxury arm was born just over a year ago, so Genesis will take time to cement itself into car buyers’ collective consciousness. But initial signs are good that it will grow into a brand distinct from the carmaker that delivered it into this world, strong and confident enough to fight the likes of Lexus, Infiniti and one day even the trio of Teutonic giants. Our particular Genesis G80 was the range-topping 5.0-liter V8 variant, packing a 420-hp punch and all the trimmings. Comfortable, compliant and a pleasure to spend some time in as both driver and passenger, it was hard to fault the car as a standalone product. Start comparing it to the likes of BMW and Mercedes and you’ll find obvious flaws, but for $55,000, you get a hell of car for the money.